Observed on stems of a cucurbitaceae (squash family), at Eldoret, Kenya, January 2012. 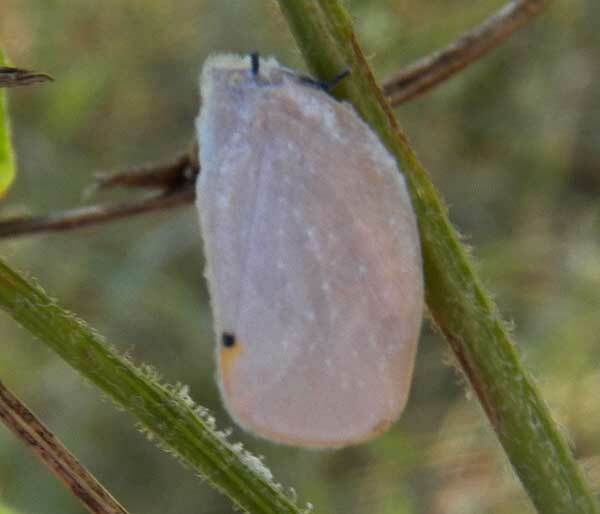 Flatid Plant Hoppers belonging to the subfamily Flatinae hold their wings folded like a tent over their back. In the image at left the head is at the top where one black eye and one black leg are visible. The black spot on the wing, lower left, might be an eye-decoy - a marking to direct a potential predator's attention away from the vital head. Flatidae feed on phloem sap drawn from the plant through fine, syringe-like mouthparts. The fluid diet is high in sugar relative to other nutrients; flatids use this extra sugar to build powdery wax that coats the body and wings. The bugs thus appear inedible and in addition the wax is slippery. Plant hoppers also have powerful hind legs that can propel the bug sharply and thus escape an encounter with a predator.